I follow several artists on Instagram, and @ByMariAndrew is one of my favorites. Her illustrations are outwardly simple, but she pours intense meaning into them. Her work has made me laugh, made me cry, made me feel all kinds of feelings. It always gets me. Am I There Yet? : The Loop-de-Loop, Zigzagging Journey to Adulthood by Mari Andrew. Buy it. The first image you see on the homepage of her website is actually a great introduction for what I want to talk about today. I didn't even know this illustration was on her homepage, I just visited her site while writing this post and that image fit perfectly! Which is broken (in a moment of weakness, distraction, heartbreak, sweaty hands; the cause is immaterial). But then, she proudly displays a mosaic made from the broken shards, just as beautiful as the vase. In fact, maybe more beautiful, because of the love poured into the making. Illustration by Mari Andrew, 2018. Used with permission. 1. Throw it away. It's useless realism with optimism. 2. Try to repair it with glue. Optimism without realism. It will look like nothing happened. But I know coffee with seep through, if not now, at some point. It's broken; it's not the same. It won't function the same way every again. 3. Take its two broken pieces and display them as is. Realism and optimism. Here is something that mattered to me then, and matters to me now. It can no longer work, but it was once useful, is always special, and can still be beautiful." Of course, as she pointed out in the instagram caption, this is about a lot more than a teacup. A number of people commented with the story of kintsugi, or kintsukuroi, a Japanese technique of repairing broken ceramics with gold, resulting in an even more beautiful object. An absolutely beautiful sentiment, but not a practical one. I can't image she has a bunch of molten gold sitting around to repair her teacup. Quite a few advised she repair the cup and make it into a candle or plant a little flower, cactus, or succulent in it, redeeming it with a new purpose. Again, a lovely idea, and probably a longer-lasting and more successful way to tackle Option 2. Finally, a number of people suggested, possibly thinking of her earlier illustration with the broken vase, that she create a mosaic from the broken teacup. This is an option... and it's one that requires time and creativity, and a lot of emotional willpower. These are all beautiful and have their place. I don't want to say that any of those comments were wrong or unhelpful or stupid or unfeeling. The fact that these people shared their advice and ideas shows that they care and want to help. If they didn't, it would be a whole lot easier to just scroll on past. So don't get the impression that I'm bashing those people or their ideas. But I think, a lot of times, we don't know what to say when someone is hurting. We end up sharing something unrelated or impractical as we try to lend deeper meaning to their pain, or give helpful advice that addresses the specifics while missing the point. Or, we unknowingly offer advice that jumps several steps ahead in the process. She may very well choose to create a mosaic from her broken teacup. It would be a lovely way to display it. Sometimes, artists can use their pain immediately and create powerful art with it. It can be extremely cathartic to make art from pain. But mixing pain and paint can sometimes take a lot of time. Sometimes, the will to create feels weak under the weight of that pain. Sometime the inspiration sticks in the slow lane and doesn't arrive right way. Sometimes, we need to simply take our pain, our broken treasure, and let it rest. Put it on a shelf and let our emotions recover. Allow time for our hands, cut from picking up shards of porcelain, to heal. My grandpa passed away last spring. He and I were close, and it was very painful. Still is. In the days after my grandpa died, I started painting a copy of this photo. Tractors were his favorite things, after God and family. 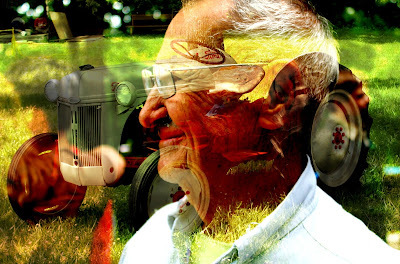 He spent countless hours attending tractor shows and working on old tractors. He worked as a minister and an auto mechanic, and after he retired, he continued serving his church by taking his tractor out and mowing the church lawn. So I wanted to paint this image of him (taken when he was smiling at the antics of his daughters, my mom and her four sisters, at a family reunion a few years ago) overlaying an image of a tractor. It just captures him, in my eyes. I started the painting, but couldn't really get past a simple wash - a super watered-down underlayer of paint which blocks in the basic sections of color and ensures there won't be any white specks of canvas peeking through the paint. It was just too much for my heart to handle. Maybe someday I'll turn that teacup into a mosaic, but for now I'm letting the pieces rest on a shelf in my heart (and in the drawer where I stash my small canvases for future use). My favorite comments on Mari's post spoke to the deeper meaning (the "it's not entirely about a teacup" part). These comments, of which there were only a few, were the ones that said something along the lines of "I love you, and your metaphoric teacup may be redeemed one day, but it's okay to pause at Option 3 for some time." Some of these people shared brief stories of their own metaphoric broken treasures, but they all simply accepted Mari's loss and loved her where she is - a woman with a broken teacup*. If you've got a broken teacup, you don't have to turn it into art right away. I would love if you turn it into art, but you can take your time. If you know someone with a broken teacup, just love them. It may take a long time for their heart to make that mosaic... and that's okay. *that's not entirely a teacup.